I love St Patrick’s Day. I love the sillyness of it, that everything is green, you drink lots of beer (ok, maybe not this part, I don’t drink beer) and corned beef. OMG, I love corned beef. It’s one of my very favorite foods. If it wasn’t so darn salty that I swell up like a water balloon I would eat it every day. Don’t get me started on the potatoes that cook with it. But alas, I do only eat it once a year. And every year, never fail, I say “next year I shall corn my own corned beef!” I always forget this, tho, before the next St Patrick’s Day rolls around. This year, I have done it. While I sit here typing, my beef is happily corning away in the refrigerator. 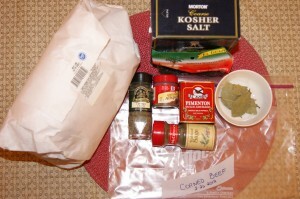 After asking a few folks who have corned their own beef I went looking for the perfect recipe. No saltpetre, no nitrates wanted. I went with Julia Child’s very simple rub. It’s recommended that you begin the process at a minimum of 2 weeks prior to the big day. Yesterday I went shopping for the ingredients. I live in the middle of nowhere, no huge supermarkets here. And since there were no briskets to be found, I went with a TriTip. After assembling everything together, here’s the rub. 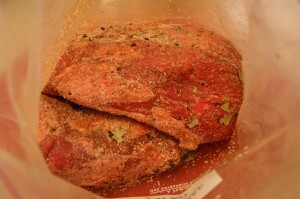 In a 2 gallon ziploc type bag I then rubbed the meat with the seasoning. 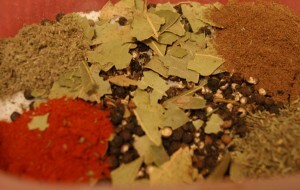 Meat is rubbed with seasonings. I pressed out all the air and it now sits quietly in the refrigerator with 12 packs of soda sitting on top of it to keep it weighted. I’m assured that tomorrow a liquid will be present, the beginning of the corning process. Every day I must massage it well.